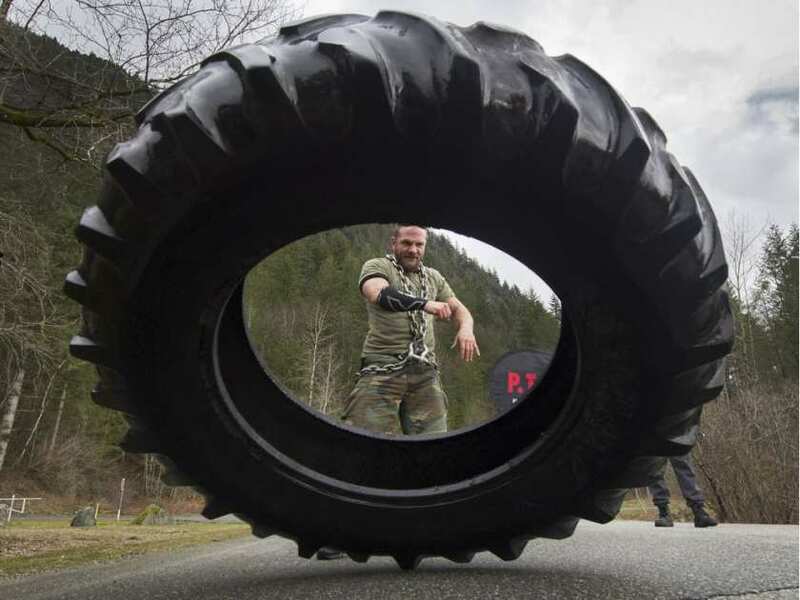 Terrance Joseph Kosikar is 43-years-old and lives in the beautiful back-country mountains of British Columbia, Canada. On the opening day of the Vancouver 2010 Winter Olympics, a luge athlete by the name of Nodar Kumaritashvili, was killed during a training run at the Whistler Sliding Centre. After crashing out of the exit of corner 16, Nodar had left the track clocking over 153 kph, hitting a solid steel post, with his body landing 20 feet away from First Responder Terrance Joseph Kosikar. After doing CPR for over an hour, there was nothing more medical staff could do for Nodar. He was pronounced dead and the games went on as if nothing had happened. 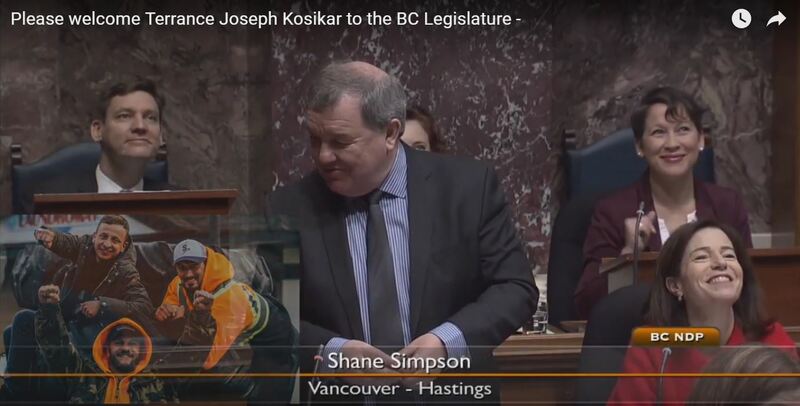 A year later Kosikar had quit his job as a medic at the Whistler Sliding Centre, checked into the Vancouver Coastal Health Detox centre and tried to seek help through WCB (Workers Compensation Board) after being diagnosed with Post Traumatic Stress Disorder (PTSD). Over the next 5 years, Kosikar lost his career as a POC Firefighter, Emergency Medical Responder, and volunteer Ski Patroller. He stopped playing on both of his hockey teams and quit coaching his stepson’s high school basketball team. He struggled with addiction, three attempted suicides, and the loss of his family of 13 years. 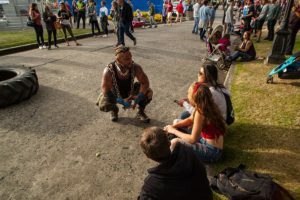 Last year, three denials later, after not being able to prove his PTSD was work-related through WCB, and still not getting any help for a wound that was not visible, he was trying to survive homeless and hungry in the Downtown Eastside. Exhausted with life, he found himself on the Lions Gate Bridge ready to jump. Something within him however stopped him. It got him off the bridge and took him into the backcountry where he struggled for weeks withdrawing from all the medications, away from the distractions and losses he had endured over the years. Within four weeks of having that personal time to heal, he had never felt better in his entire life. He could finally see straight again and have control over his thoughts and feelings, with a better understanding that everything that had happened had not been his fault. 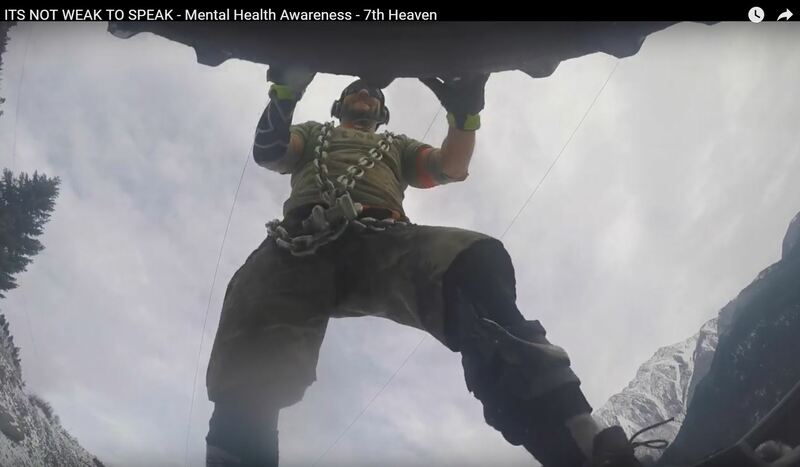 As Kosikar says, “It’s just the way my destiny was written.” He believes that everything that had happened, was to prepare him for this next part of his journey – helping others who live and struggle with PTSD. 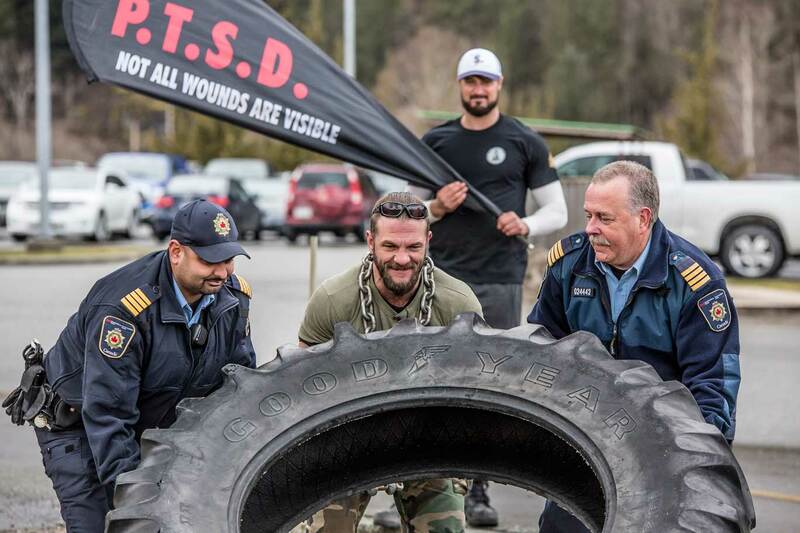 Newly healed, Kosikar spent three months without a penny to his name, working hard towards starting a camp for other First Responders who live with PTSD and who may have lost their jobs, their families and are contemplating suicide. A camp that will give them one last chance to get their life back, as he did. In that three month period Kosikar worked 20 hours per day and raised over $82,000 through sponsorships and ran Phase 1 of Camp My Way. 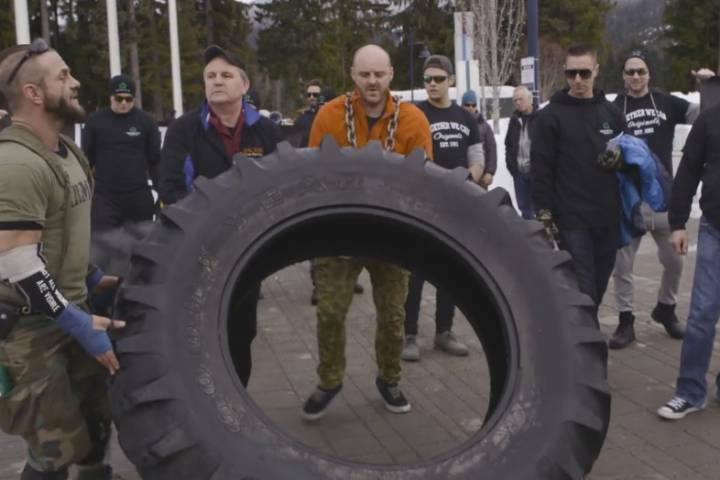 When Phase 1 of Camp My Way ended last year, Kosikar wanted to do something that would not only bring more awareness to PTSD, but also serve the memory of Olympic Luge Athlete Nodar Kumaritashvili, who had died in his care five years earlier. On February 12th, 2016, six years to the day that Nodar had passed away, Kosikar started Breaking the Chains BC. 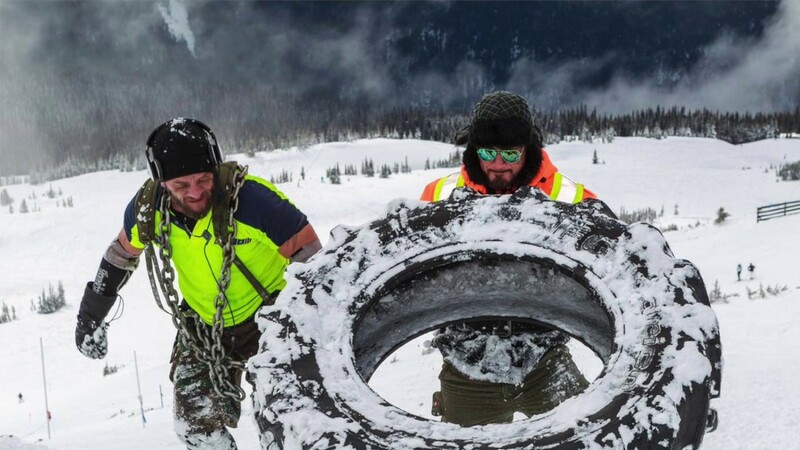 He chose to flip a 400 pound tractor tire 30 kilometers in 30 days, across seven mountains while wearing 52 pounds of solid steel chains. Kosikar learned that he was truly not alone in the battle with PTSD. In the last two years, over 150 Canadian First Responders have died by suicide. 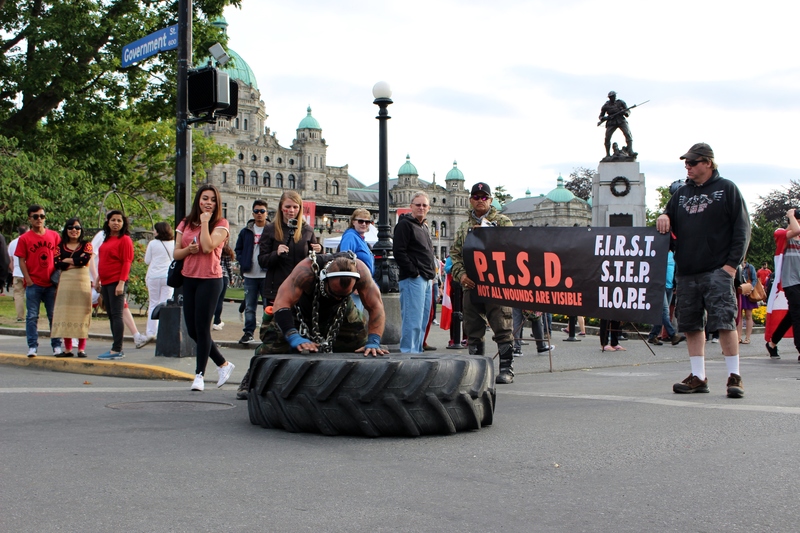 Those numbers are for firefighters, police officers, paramedics and military personnel who had been diagnosed with PTSD. This number really bothered Kosikar so he decided to fly over to Germany to learn what their suicide rate is for their First Responders. To Kosikar’s suprise, there has not been ONE SINGLE first responder who has taken his or her own life from living with PTSD in Germany. Why? When a First Responder is diagnosed with PTSD, he or she gets help THAT SAME DAY, no questions asked, no hoops to jump through, no years of trying to prove their PTSD is work-related. It is presumed that because of the nature of their job – with all that they see and take home with them each day – that their PTSD is work-related and they get the help they need immediately. Upon learning this one month ago, Kosikar wanted to draw attention to the fact that WCB does NOT recognize PTSD as a workplace injury. 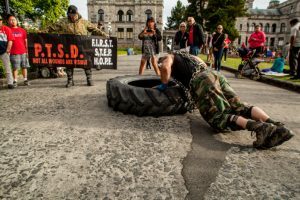 He chose July 1st, Canada Day, to come to the Legislature in Victoria BC to flip his tire while still shackled in over 50 pounds of steel chains, to inform the public of the changes that need to be made and allow people to sign a petition that will try convince the BC government to make changes immediately. So far over 300 First Responders and members of the public have signed the petition in the last week. Last year, Alberta, Ontario, and Manitoba First Responders secured the help they need immediately through Worksafe in their provinces. Yet British Columbia First responder still have to suffer in silence and do NOT get the help they need from WCB. When we need a firefighter, a paramedic, or a police officer, they come no questions asked. Perhaps it is time they received the help they need after working for us, with no questions asked. PTSD – Not All Wounds are Visible. A petition to help bring awareness can be signed here. Click here to learn more about Breaking the Chains. While we appreciate McCloy’s response to the story, isn’t this the exact thing Kosikar is fighting back against? 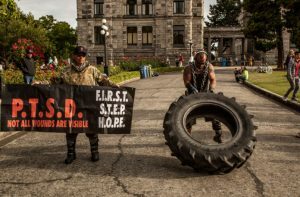 CANADA DAY – Presumption of Illness petition – HUGE SUCCESS!